But is the Xiaomi Mi 4 the real deal? Is this the best phone in the world right now? Xiaomi may not be particularly well known outside of China, but in its homeland it's a huge company with a dedicated following - and it's just launched a new smartphone in the form of the Xiaomi Mi 4. 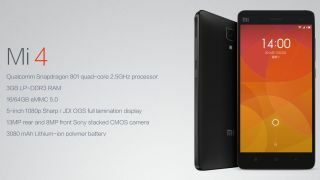 With a 2.5GHz quad-core Snapdragon 801 processor and 3GB of RAM, Xiaomi reckons the Mi 4 is the 'world's fastest smartphone'. It does ever so slightly trump the 2.3GHz quad-core 801 chip and 3GB of RAM found inside the Sony Xperia Z2, so it has some decent grounding for its claim. As well as a decent amount of power the Mi 4 also boasts a 5-inch full HD display, the choice of either 16GB or 64GB of internal storage, a 13MP rear camera, 8MP front snapper and a 3080mAh battery. In terms of design it looks like Xiaomi has taken a leaf out of Apple's book with a stainless steel band encompassing the slender device. Price wise the Xiaomi Mi 4 is quoted at a rather affordable $320 (around £190, AU$340) for the 16GB model, and $400 (around £240, AU$430) for the 64GB variant. Xiaomi has previously said that it wants to expand its reach in global markets, although it's not clear how far reaching the Mi 4 will be - it may well be an import only option in many countries. Can the Mi 4 do enough to trouble the world's best phones?